So last night's premiere on ABC Family was a bit of a disappointment - a Halloween episode of Pretty Little Liars. I don't watch the show, know anyone who watches the show, or have any interest in ever watching the show, so needless to say, I passed. But tonight is a win! HOCUS POCUS baby! Is there anyone who doesn't like this movie? 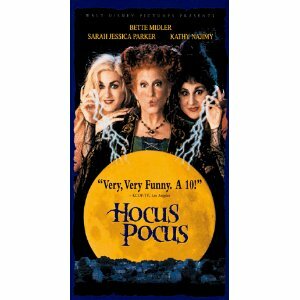 I mean seriously, Bette Midler, vintage SJP, and it takes place in Salem! It's classic. And yes, I own this movie. And yes, I can just watch it anytime I want, but there's something more fun about catching it when it's on TV during Halloween! So in honor of the movie tonight I made up Monster Taco Salads. I probably should have made something witch themed, but let's not talk about that right now. The idea was taken from here but obviously veganized and changed a bit. The Monster Taco Salad is made up of a layer of crushed blue corn tortilla chips, refried beans, Boca crumble mixed with taco seasoning, Daiya mozzarella and cheddar cheese and shredded lettuce. Assemble the first four layers then stick in the microwave for about a minute to melt the cheese. Sprinkle the shredded lettuce around the bean/crumble/cheese mixture. The eyeballs are made out of slices of tomatoes that are filled in with a sour cream/taco seasoning mixture and topped with a sliced black olive. And the mouth and fangs are just another slice of tomato with plain tortilla chip fangs. Does anyone else think this kind of looks like Oscar the Grouch? Minus the fangs of course.